Breathable lining and 5 vents in palm for wicking sweat to reduce the possibility of bacteria from thriving. Thick foam padding for impact absorption and pressure distribution, 360 degree protect fist and buffer punching force to avoid hurting yourself or partner. 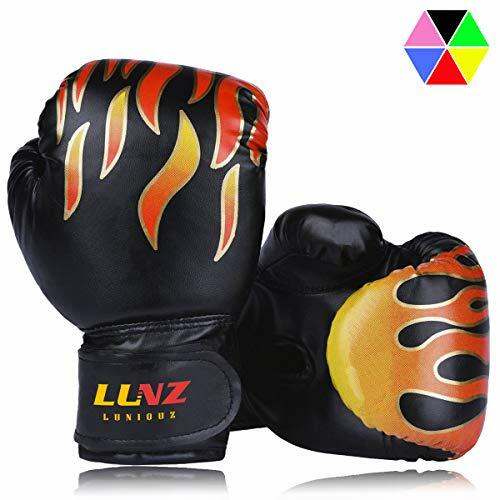 Living combative blazing pattern on the fist, an unique gift for kids to catch their eyes at the first sight. Integrated mold cut with level flexibility, snug fit hands for punching bag exercise. Wide velcro tape on the sleeve to adjust properly for comfortable wear. It can lead you to correctly position hands to prevent sprain wrist.